This is the E-bike for the serious rider and at $3K it really becomes an investment more than an expense. An investment in doing your part to reduce your carbon footprint...an investment in the quality of the ride... an investment in staying in shape...an investment in making a personal commitment to slow global warming...an investment that will allow you to save money far greater then the cost of the bike... and an investment in getting a bike that will last for years. 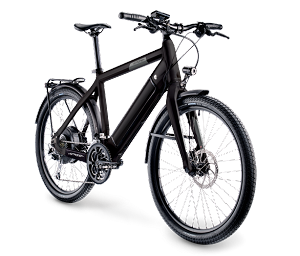 Equipped with Stromer's Power 48 motor the ST1 Platinum is geared towards riders looking for a higher top end speed, as this E-Bike can reach up to 28 mph, its a perfect match. The ST1 Platinum is pedal assist only. That means you have to pedal to make it go. A button on the LCD control panel mounted on the handle bars controls the level of assist The rider can choose from 4 different levels of assistance. 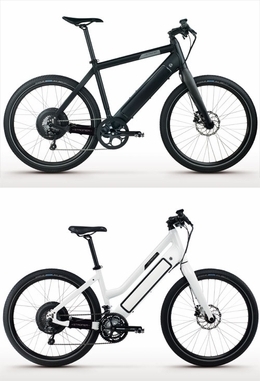 Disk Brakes: hydraulic disk brakes that are adapted to the high weight of the integrated E-Bike. Regenerating Brakes: when brake is applied, the momentum of the bike regenerates the battery giving you greater range. Tires: Schwalbe BigBen tires offers increases shock absorbstion and puncture resistance. Fork: carbon fork minimizes impacts and vibations making for a very comfortable ride. Level of assist can be controlled via the control panel. The rider can choose 4 levels of assistance. ECO , CITY, TOUR and POWER. Other information is also obtained though the control panel, such as SPEED, Average SPEED, TRIP TIME, TRIP ODOMETER, TOTAL ODOMETER, TIME of DAY, and battery level. Top Speed: Up to 28 mph. The battery can easily be removed for charging in you office or work place.